The comedian at a Miami Heat-Dallas Mavericks NBA Finals game earlier this year. Comedian George Lopez said he is creating a new family-oriented sitcom where he will play a father and husband, vowing to return to television less than two months after TBS canceled his late night show "Lopez Tonight." 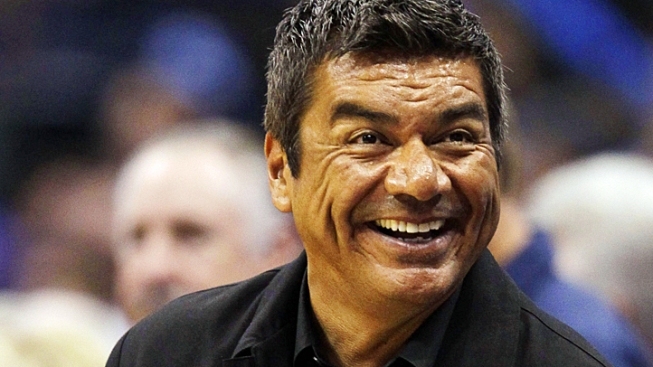 Lopez told The Associated Press his now untitled show "will be the opposite" of "George Lopez," the syndicated television sitcom that aired on ABC from 2002 and 2007 and made him a household name. He also plans to star in his third live HBO standup special next year, his first since 2009. Viewership for his late night show on TBS declined heavily in its second year. He says the show suffered after he lost his 11 p.m. Eastern time slot to Conan O'Brien. He said TBS' plan was for Lopez to go on after O'Brien at midnight and win over O'Brien's young viewers. Instead, Lopez's total viewership dropped 40 percent in its second year, from an average of 910,000 nightly viewers to 543,000. By August, the audience had dropped to 391,000. The comedian said it is unfortunate his show was cancelled because there are few minority hosts on late night television. "I was heartbroken. Late-night talk show needs diversity," actress Eva Longoria told the AP about the axing of "Lopez Tonight." She attended a charity gala with Lopez in Las Vegas Saturday night. Lopez, who often lampoons his Mexican heritage and upbringing, said there will not be a grandmother figure on his new show. On "George Lopez," Lopez often verbally sparred with an actress who played his mother. He promised he would tease all of his coworkers if the show is picked up for TV next fall. "Whoever is my relative, I will not be nice to them," he said.